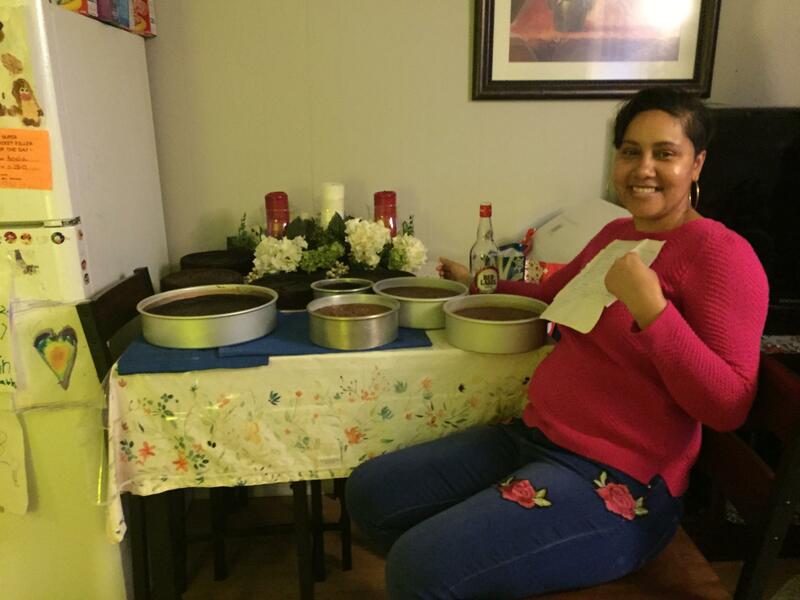 Judeen with her family's recipe for Jamaican Rum Cake, also known as Christmas Pudding, Black Cake, Christmas Cake. Aunt Julian Clark: It name Christmas Pudding, it name Christmas Cake, it named Rum Cake. It has a lot of name. But it’s the same thing. It’s the same cake they’re talking about. Ali Berlow: That’s Julian Clark and her niece Judeen on Martha’s Vineyard. Judeen: Plenty people call it Black Cake as well. It’s the same rum cake. AB: The cake is rich and dense and dark. One of its key ingredient is a liquid called browning. Judeen: The cane sugar is broken down into molasses and that’s what they use to make the browning. AB: Browning adds a touch of bitter which helps balance out the sweetness of the brown sugar and spices like nutmeg, cinnamon, almond and rose water. The cake is smooth all the way through and has a moist, almost wet crumb. Aunt: You can’t specifically point out to which fruit you eating. That’s it. Everything combine and everything come together, blending so good that you don’t which one. I don’t taste the prunes, I don’t taste the raisins, I don’t taste the cherry but everything is inside it but you cannot identify one fruit from the other. Judeen: We blend it out. AB: The dried fruits infused with alcohol are pureed in a blender. Judeen: We steam the fruits with the rum and wine and then when we’re blending it out we add a little more rum and wine. It’s always about the rum and the wine. AB: It’s not chunky. There no globs of candied fruit like those weird green cherries. Judeen steam bakes the cake and that helps create a dense and even texture. Judeen: It gives it more like a pudding texture more than a regular cake and it doesn’t make it that dry you know. Rum Cakes, baked and unbaked. AB (on tape): And how long does it have to bake for? Judeen: Most times like two hours. Because I don’t make my cake very thin. After every one comes out of the oven I use the red label wine and pour over it so it soaks in while it’s hot. AB: Wetting the cake with wine and rum keeps it from becoming dry so it’s good for weeks. Months, even. Judeen: The longer these cakes stay, the better they taste. That wine ages, the wine and rum ages and that’s when that cake starts to taste really good. We always said, when we have cake leave for January, after January, we’re like, Mom, this is when the cake starts to taste really good so we always leave a cake till after January and that’s the time we have it and that’s the time that cake tastes really really good. AB: Recipes like this rum cake are like family heirlooms. Judeen keeps hers close. Judeen: This recipe that I used has been in our family for centuries. It’s only passed down to the first born women in the family. The way my mom got this recipe was my great aunt. Aunt: We used to call her Tita, that’s our name for grandma but her name was Ethlyn. Ethlyn Dillion. 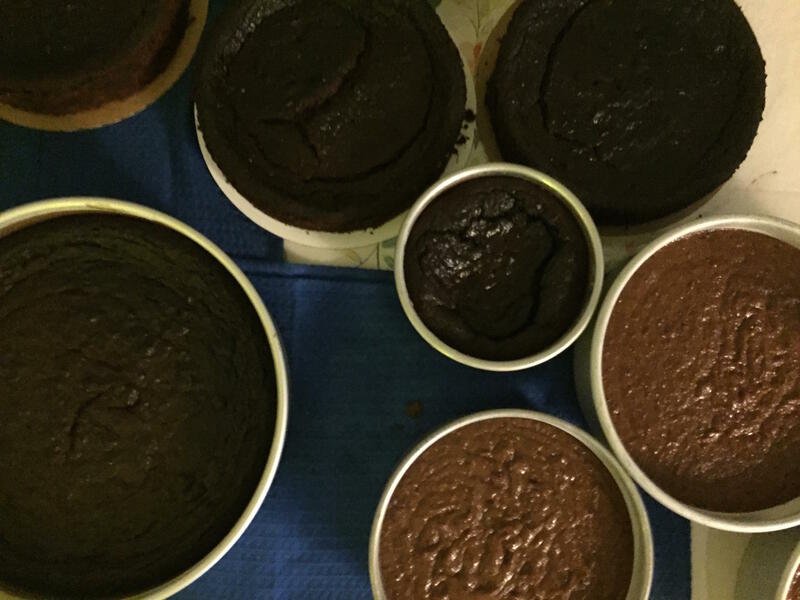 Judeen: Every time I make this cake – it bring back so much fun memories as kids because we used to go to her house for her to make the batter because she would not give the recipe to anybody. And we would stay outside and we would play while she sits in the house and make the batter and when everything is over she’d call my mom and we take it and before she died she gave my mom the recipe. And when I was migrating from Jamaica I said to my mom you know I’m not going to be at home anymore you got to pass this recipe on to me now. Aunt: Cooking and baking is a love tradition. It’s love. When you know it’s the end of the year everybody giving back. Everybody sharing. As I said no matter where the malice is during the year, no matter what the molligrub with the family or anything, the fuss, when it comes to Christmas all that is forgiven. It’s a tradition. You have to give back. This piece first aired in December 2017.